I would like to be able to run an Income Report by Product Group with months in columns at the top and totals at bottom. It would be great if this could combine Rental, Sale and Service Items all in one report. It is very time consuming to download each of these separately and sort and get the information i need. It would be very handy for us if there was a report that showed opportunities, income, costs, and profits for a given timeframe. This is useful for producing management accounts. At the moment we're inputting all this data into a spreadsheet manually which is very time consuming. Can you have a report showing total dollar value of quotes and bookings in the system for following and upcoming months for budgeting purposes. It would be good if you could filter the total between confirmed bookings and quotes. If this could also include the current month so you could then get a total value of bookings and quotes (not just bookings) in the system. Management ask for this every month to get an idea of how we are going financially and I have to click on each booking and quote and add them up manually! This would allow your products to have the original purchase cost set against the, this would then have a predefined depreciation amount where it would take a preset fee/percentage from each hire of an item that would go towards repaying the original purchase cost, perhaps you could you also reflect this in the profit percentage that you and it could tell you how many hires you would need to pay off the original purchase cost? And then some form of syntax/sql to allow for us to create our own custom reports from the data available. Sirportly (www.sirportly.com) does this really nicely. 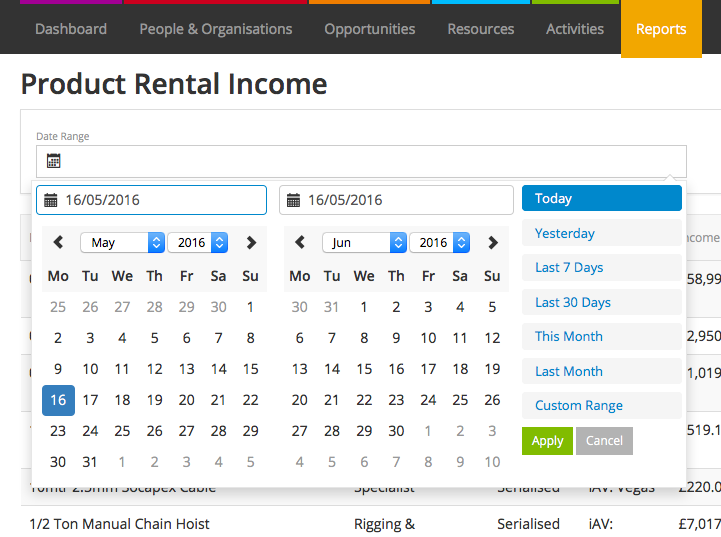 Our latest update to Current enhances the Reporting functionality so that now you can filter by date. Simply use the “Date Range” box at the top of the reports. Perhaps within the Customer Income Report, an additional column to show what Profit Margin was made against the customer (income minus the costs). My income report isn't accurate if it doesn't exclude items I have to sub-rental from vendors. It would be ideal to allow for a report that only lists income from items that were not sub-rented. On each opportunity screen there is already a button that downloads a csv dump of line item data on that particular opportunity. If the Current programmers could do a little tweak and include as few as 4 extra columns to the outputted csv file, then we might have the basis of an almost comprehensive reporting capability. With those 4 extra fields on every row - together with additional csvs generated from custom views of customers, opportunities, products invoices etc - you could use a reporting tool like tableau, or crystal reports or filemaker etc to connect to the excel sheets and link tables on the new id/key fields and there you have almost a complete custom reporting capability with what I think would be very little time and effort for Current's programming team - I stand to be corrected on the level of difficulty - I honestly have no idea how hard that would be. 1) not everyone has a license or knows how to use the above software - but many people have and know excel and maybe just pivot tables alone might produce something more useful than were getting at the moment..
2) downloading a csv for each booking and adding all the rows to a master sheet would be extremely tedious - which comes to the next ask - can the guys provide a csv download of the same data for all the line items on every opportunity? Maybe that could be added to the export data page (system setup>utilities), where you can export customer data, contact data etc etc. That would be a logical place. I note that the custom reports wish has 330 votes and Michael has it tagged as Under review. I understand how the team has to prioritise their programming time - and a fully fledged integrated reporting engine will IMO just not make it to the top of the backlog any time soon - despite it being a crucial missing feature and a deal breaker for many considering Current. Doing the above might just keep enough of us happy for a while or even permanently. And I am absolutely certain that being able to answer prospective customers reservations about reporting capabilities with a bit more certainty than "it's on the wishlist" will help convince them. I am attaching an excel sheet which shows the existing opportunity specific csv download colunms in black and the additional columns in blue. Much as I've said that this can be done with as few as 4 extra fields, Ive included a few more e.g. Organisation name and Opportunity number - so that the initial download can be understandable as a stand alone sheet without having to pull linked data from other sheets. When sub renting equipment, it would be great to attach a text item to an existing product group so that when I run a report it is contained within that category (goes in to the lighting income for example). At the moment it just groups the text items together. I would like an opportunity cost report that could filter by project and/or opportunity. Eg a project budget tool to manage opportunity costs against a budget set. This would need to items to be set to a cost group and cost to be set to a cost group. This could be an addition to the Reports tab. Pull a report by date range that lists a each type of stock movement. You currently have the following options under product transactions. Exportable to csv. excel etc.. When I run a report, for instance, customer income, I would like to be able to click on a column title (e.g., Rental Income) and have the report sorted in order of customers with highest rental income. Currently I have to download the report as Excel and then sort in that application. Report that shows by customer what is booked without clicking in each customer.